Spencer: I’m a sucker for fight scenes. When I was younger, my top priority for any piece of media I checked out was “lots and lots of fighting,” as my voracious consumption of Dragonball Z in middle and high school can attest to. I still have a soft spot for this kind of action — and I look forward to lots of lovingly, intricately choreographed fight scenes when I finally get to see Captain America: Civil War on Friday — but as I’ve grown older, I’ve come to realize that action without any sort of substance supporting it is just hollow. While the “Final Days of Superman” storyline has plenty of substance to it, little of it makes its way into Batman/Superman 32. This issue has tons of action, but little of it means anything. Moral of the story: never fight Wonder Woman. It won’t end well. Sadly, though, there’s more to dislike about this sequence than like. It’s the “let’s you and me” fight trope to a “T,” and invoking it kinda makes our heroes look rash and hotheaded. 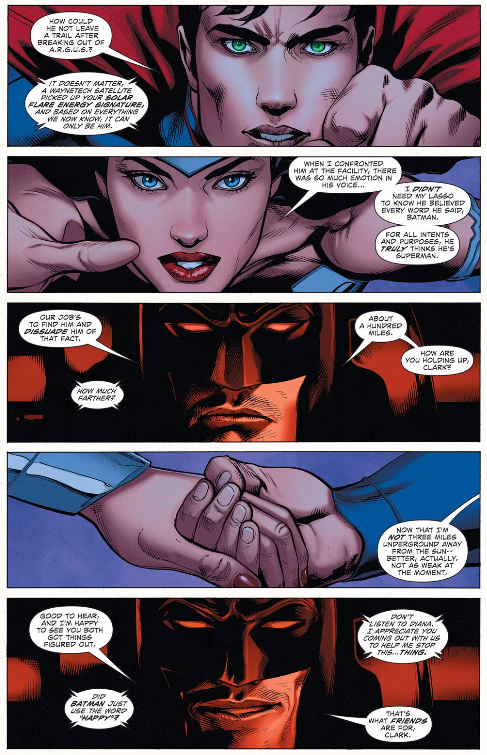 Why do Superman and Wonder Woman react to the Great Ten’s aggression this way, other than because the two teams need an excuse to fight for half an issue? Wonder Woman feels especially egregious — yeah, she’s the fiercest warrior in the DC Universe, but she’s also a peacemaker above all else. This isn’t very diplomatic. The two teams’ initial hostilities feel particularly strange in light of how well they get along later in the issue, but even that peace comes about strangely. August General in Iron seems to change his opinion on the American heroes almost at random — at first he wants to keep them out of China completely, but once Superman saves his life he allows them to accompany the Great Ten into the country and essentially direct the mission, but then, after Dr. Omen frees her Superman clone, August General decides that the Great Ten will handle the mission on their own and again asks the Americans to leave. While I like the respect forged between Superman and August General in Iron by the end of the issue, that respect doesn’t feel earned, and I can’t track why the General feels the way he does about the Americans (and why his opinion keeps changing) across the issue. His objections are based on what will cause the most conflict or move the plot in the right direction, as opposed to springing from his character and personality. Perhaps most frustratingly, the Great Ten appearance and battle feels like nothing but filler, here simply to ensure this issue has some action in it somewhere. 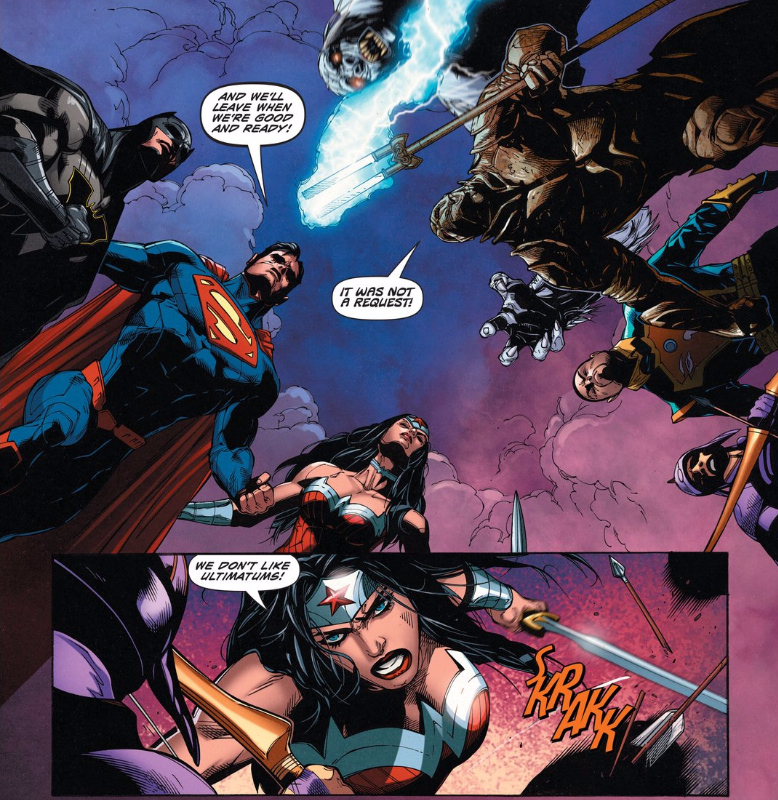 Like Superman’s tussle with Ulysses in last week’s Superman/Wonder Woman, this battle is completely unrelated to any of the story’s ongoing plots, and serves only to distract from them. Actually, that begets the question: what is the “Final Days of Superman” story actually about? Is it Superman’s impending death and his quest to say goodbye to the people he loves? Is it the impostor Superman? Is it Dr. Omen’s clones and Zodiac creatures? Tomasi would probably say that it’s about all three, but none of these plots seem to fit together all that well. The latter two aren’t bad concepts, but what do they have to do with Superman’s death or final days? They’re Superman stories you could tell at any time, and that’s not what we need right now. Moreover, the most engaging chapter of this storyline so far — its first, the sublime Superman 51 — decided to forego outside conflict entirely, focusing only on Superman and his loved ones’ reactions to the news of his death, and it was all the better for it. Now I’m not saying that Tomasi should be writing a story without a villain at all, but I am saying that the villains thus far feel entirely perfunctory, as if Tomasi threw them in because he suddenly realized that, oh yeah, comics need bad guys! They’re easily this story’s weakest link, and thus this storyline has started to suffer as it’s focused more and more on the villains and less and less on Superman. Indeed, the most engaging part of Batman/Superman 32 is the quiet moment that opens the issue and focuses simply on the characters. God, this page is magical. First of all, Mahnke’s composition here is incredible — the slightly shifted alignments of each hero in those first three panels, the close-ups in each, Batman’s smile, I just love it. Moreover, the interactions between each hero here just shine. The affection the heroes have for each other and their shared senses of humor are a joy to behold, and honestly, I wish the whole issue could’ve just been more of this. This sort of scene is where Tomasi excels, and I’d love to see him write more to his strengths. I was really excited for this crossover when it began — especially when it started out so strong — but the deeper we get into it, the more it’s losing me. I still like Tomasi’s take on Superman and his relationships, but everything else just feels more and more extraneous with each passing issue. What say you, Drew? Also: were you familiar with the Great Ten before this issue? I had to hit up Wikipedia pretty hard in order to follow some of the action here. Drew: Actually, I have read 52, where these characters were first introduced, but had more or less forgotten about them. Their conflict in 52 6 is remarkably similar to this one — focusing on the geopolitics of American heroes barreling into China — but the rarity of their appearances completely undermines the global scope (and membership) of the Justice League. Why aren’t any of the Great Ten in the Justice League? Why doesn’t the Justice League run into the Great Ten more often? Why don’t any of these characters seem to have even a passing familiarity with one another? DC’s superhero stable has always been America-centric, but it’s odd to see a comic more-or-less acknowledge that the DC Universe has essentially ignored China since the relaunch. If their appearance feels out of place in the DC Universe generally, it’s even more out-of-place in the context of “The Final Days of Superman,” which heretofore was focused on Superman and his various relationships. An inevitable, impending death opened up a number of interesting ways to explore Superman as a character, and address his values and his relationship to his legacy. That said, I do think there’s room for a villain. Specifically, an impostor showing up complicates Superman’s confidence in his legacy in interesting ways. Unfortunately, this issue never forces Superman to confront that prospect in any meaningful ways — this issue is more a frivolous punch-em-up than a philosophical exploration of Superman’s identity. Failing to mine the situation for meaningful character beats isn’t great, but this issue actually goes several steps further, completely mischaracterizing Superman. Spencer identified the August General in Iron’s wild and seemingly unmotivated changes in attitude as problems, but every single one is met with an equal (and often opposite) change in Superman. Why is Superman so stubborn when he could simply explain himself at the beginning of the issue? Why is that stubbornness completely gone when he’s later told to leave China? The clearly out-of-character decision to fight at the start of the issue could indicate how disturbed Superman is at dealing with this particular problem in his twilight hours, but it’s never explored further, and is totally reversed just a few pages later. Which is to say, not only does this issue lose the thread of exploring Superman, it actively works against that thread, characterizing him in totally inconsistent and contradictory ways. Frustratingly, this issue doesn’t offer much in the way of justifying its existence in this story. By the issue’s end, Superman is just as far from his quarry as he was when it started. The only meaningful change in this issue is the escape of that clone, but I’m not convinced introducing yet another Superman impostor to the mix makes sense, given how poorly this issue manages to address the philosophical implications of the one we already have flying around. It seems clear that this impostor is supposed to be the Connor Kent to the Hank Henshaw that’s currently pretending to be Clark Kent in Metropolis, but since neither has impacted Superman himself, it’s not clear why we need an impostor at all, let alone two. Spencer, I’m inclined to agree that this crossover isn’t living up to its potential. What seemed poised for a deep, meaningful exploration of Superman has turned into a simplistic goose chase, squandering the goodwill (and comparisons to All-Star Superman) it earned in that first issue. It’s possible Tomasi will be able to pull this thing together before it concludes, but my expectations have been lowered significantly.